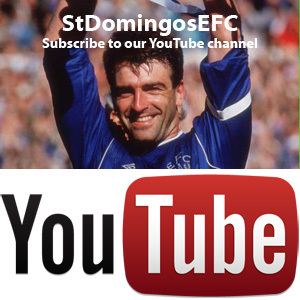 2 months ago we began a challenge to make as much Everton based video footage available as possible via a YouTube channel. Our archive of footage comes from years of collecting clips and we wanted to make as much of this collection as possible available for Evertonians to view. The response has been fantastic and we have tried our hardest to respond to requests to make clips available from classic matches. The bulk of our footage comes from the clubs glory years in the 1980s, although we do feature clips from much later as we enter into the early years of the Premier League. Many of these videos are extremely rare, some have no commentary at all and some just focus on the Everton goals scored in certain fixtures. In contrast, we have extended highlights from many games which were featured heavily on the BBC or ITV. What I can promise, is that some of this clips you will have never seen before or at the very least not for a considerable time. This project is likely to continue for sometime, and we will continue to add videos to the 150 plus we have uploaded already. Please continue to request matches, either via our Twitter page or using the comments section on this blog. We have our favourite games, but it is always interesting to hear from others and find out which matches live long in the memory of other Evertonians. This is not a selfish project, we are looking to provide a service for Evertonians who wish to look back on some magic moments from our glorious past. If anyone else has any videos they would like digitizing or adding to the channel, please get in touch via the ‘About our blog’ page and we will arrange to do this for you. Click here for a direct link to the YouTube Channel. From there you can subscribe to receive email updates each time we add other videos to the collection. Alternatively, use the link on the left hand side of this page. Click on the St Domingo’s TV link for a full list of the videos available on this site. We would like to point out that at no point are we trying to infringe any copyright, or upset the club in any way. If we are requested to, we will happily remove any video from our library or ideally, pass ownership of the channel to Everton to continue offer the service to all. Below we have included a video from 1983-84, featuring the famous Kevin Brock back pass which ignited Everton’s season and propelled the club towards it most prolific era. Previous Post Control on sales more important than transfer budget for Moyes? Next Post Duncan Ferguson – Cult Hero or Legend?